The first European to reach the cape was the Portuguese explorer Bartolomeu Dias in 1488, who named it the "Cape of Storms" (Cabo das Tormentas). 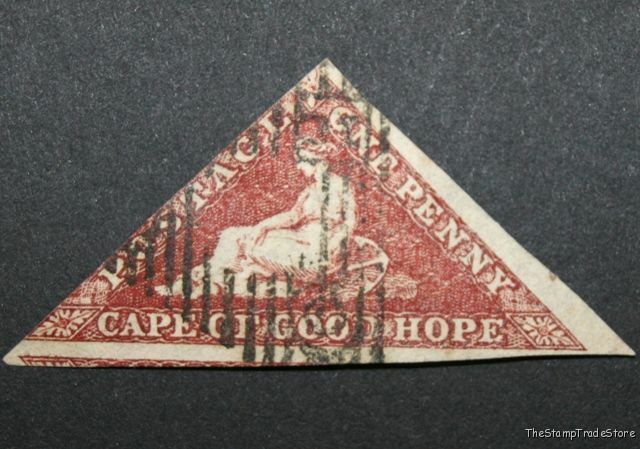 It was later renamed by John II of Portugal as "Cape of Good Hope" (Cabo da Boa Esperança) because of the great optimism engendered by the opening of a sea route to India and the East. The land around the cape was home to the Khoikhoi people when the Dutch first settled there in 1652. The Khoikhoi had arrived in these parts about fifteen hundred years before. They were called Hottentots by the Dutch, a term that has now come to be regarded as pejorative. Dutch colonial administrator Jan van Riebeeck established a resupply camp for the Dutch East India Company some 50 km north of the cape in Table Bay on 6 April 1652 and this eventually developed into Cape Town. Supplies of fresh food were vital on the long journey around Africa and Cape Town became known as "The Tavern of the Seas". On 31 December 1687 a community of Huguenots arrived at the Cape from the Netherlands. They had escaped to the Netherlands from France in order to flee religious persecution there, examples of these are Pierre Joubert who came from La Motte-d'Aigues for religious reasons. 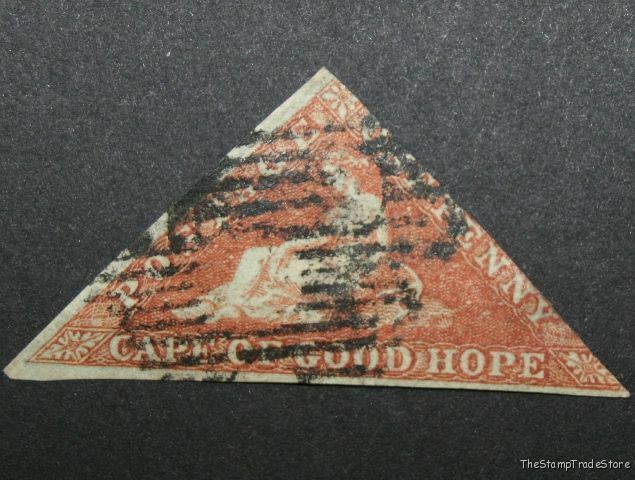 The Dutch East India Company needed skilled farmers at the Cape of Good Hope and the Dutch Government saw opportunities for the Huguenots at the Cape and sent them over. The colony gradually grew over the next 150 years or so until it stretched for hundreds of kilometres to the north and north-east. The United Kingdom invaded and occupied the Cape Colony in 1795 The First Occupation but relinquished control of the territory in 1803. 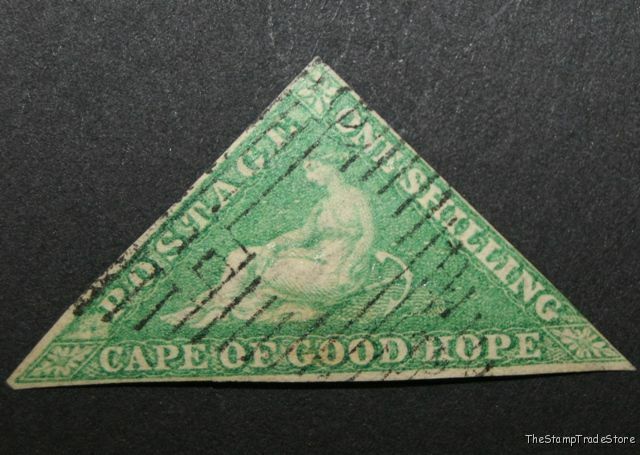 However, British forces returned on 19 January 1806 and occupied the Cape once again The Second Occupation The territory was ceded to the UK in the Anglo-Dutch Treaty of 1814 and was henceforth administered as the Cape Colony. 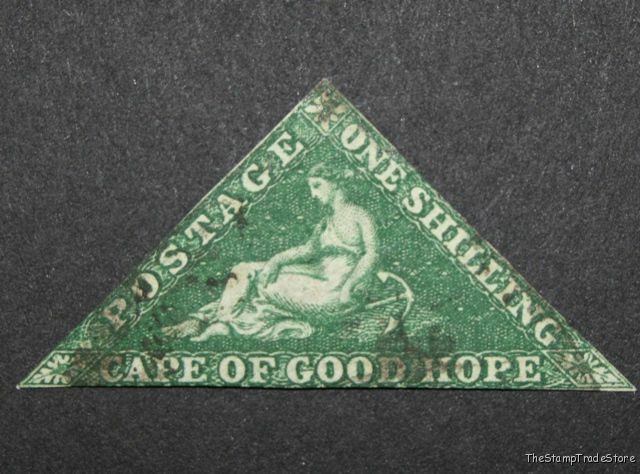 It remained a British colony until incorporated into the independent Union of South Africa in 1910. The Portuguese government erected two navigational beacons, Dias Cross and Da Gama Cross, to commemorate Vasco da Gama and Bartolomeu Dias as explorers who as mentioned were the first explorers to reach the cape. When lined up, the crosses point to Whittle Rock, a large, permanently submerged shipping hazard in False Bay. 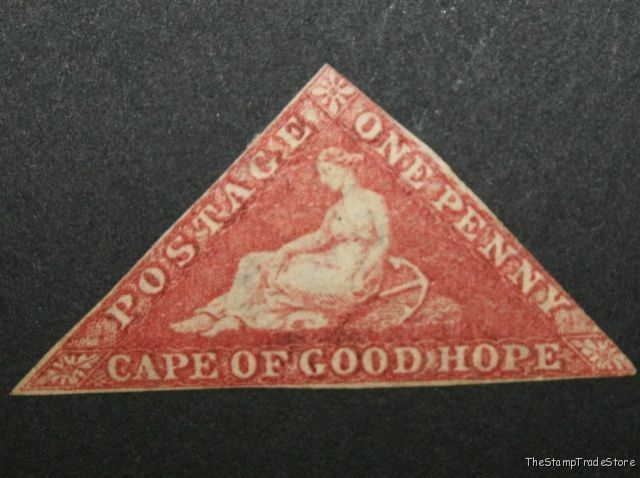 Stamps were first issued by the colony on 1 September 1853. 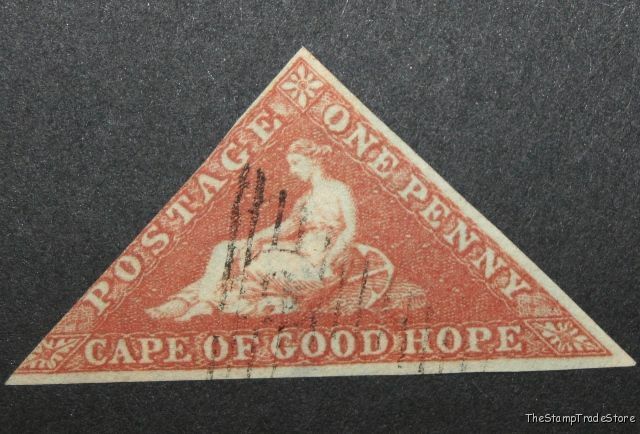 The two stamps that were issued were a one penny in brick-red and a four pence in blue. 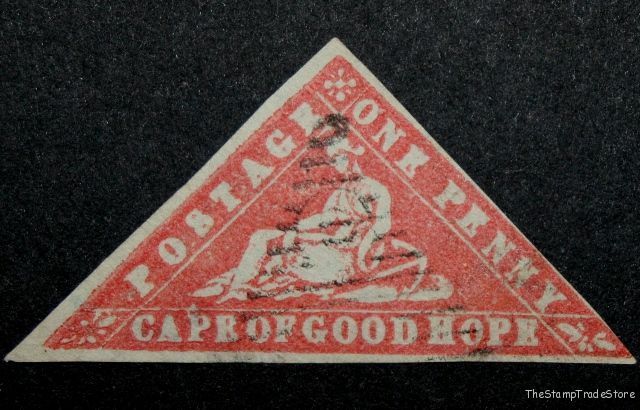 They were printed by Messrs Perkins, Bacon & Co in London. 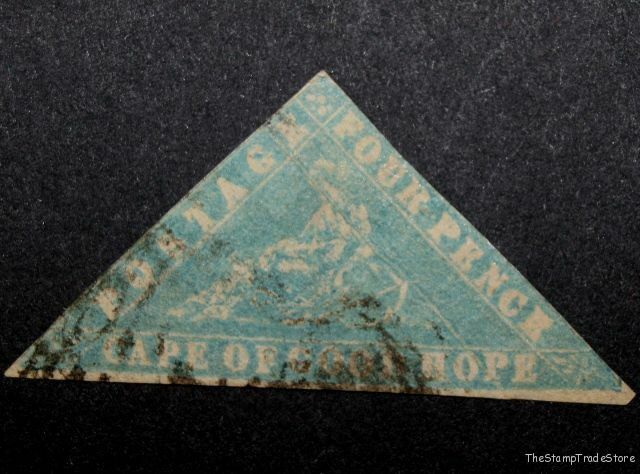 The original die for these stamps was cut by William Humphrys an engraver employed by Perkins Bacon. 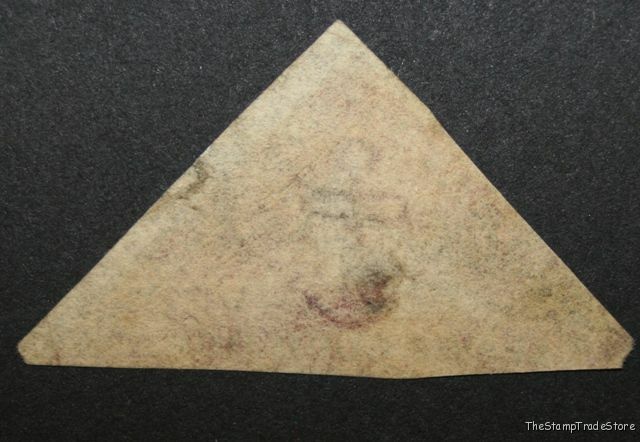 Sheets of a special hand-made paper, measuring 282 mm by 536 mm, were used to print 240 stamps per sheet. 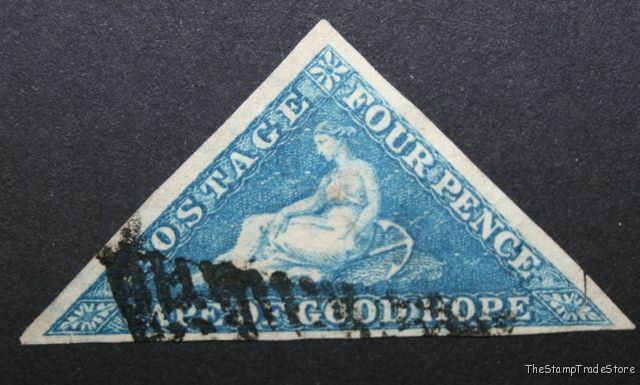 The stamps were issued imperforate. 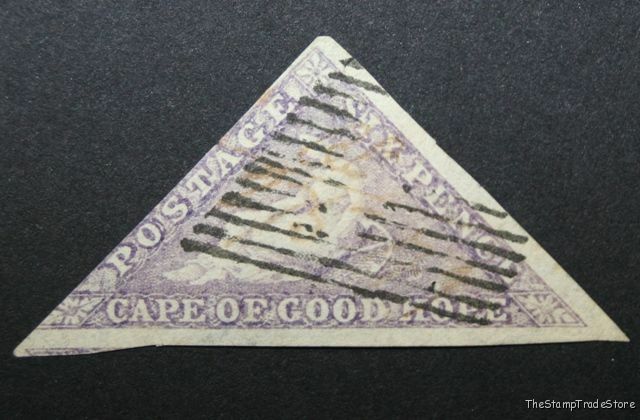 The rate of postage within the colony was 4d for a half ounce letter and 1d for a newspaper. 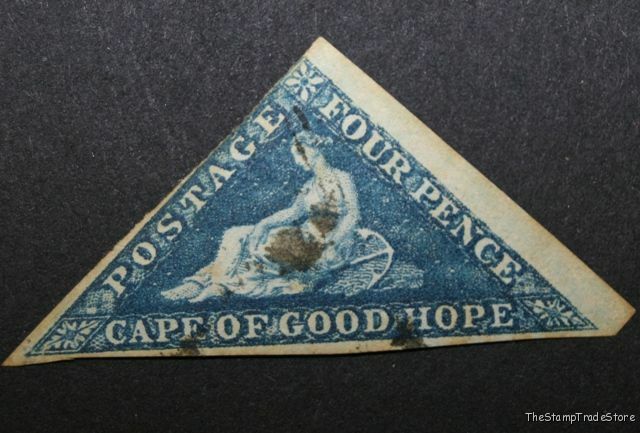 On 18 February 1858 two new values became available a six pence and a one shilling. The six pence rate was for payment of half ounce letters to Great Britain and the one shilling rate was for some foreign countries. 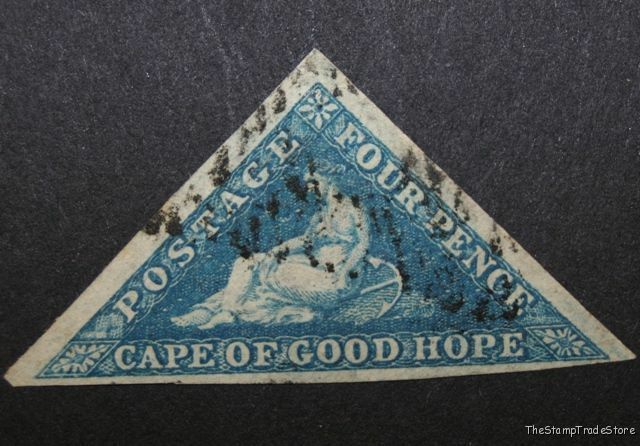 On 15 September 1860 the rate for local letters in Cape Town was reduced to 1d and a similar reduction was made in Port Elizabeth on 1 May 1861. On 1 April 1963 the rate to Great Britain was increased to one shilling if sent by mail packet and reduced to four pence if sent by private vessels. 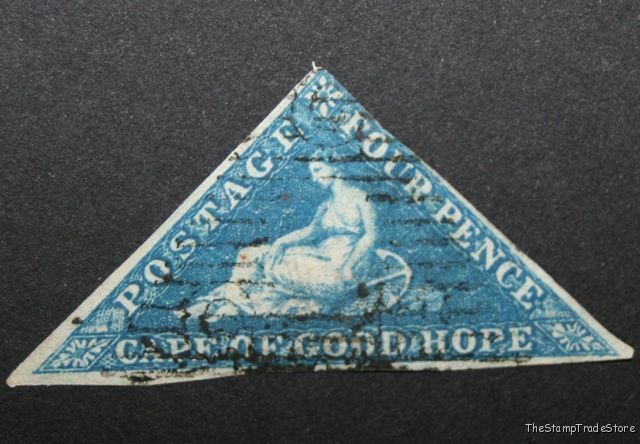 In 1861, due to a shortage of one penny and four pence stamps, a local printer, Messrs Saul Solomon & Co, was instructed to provide a supply of one penny and four pence stamps and these were issued in February 1861. 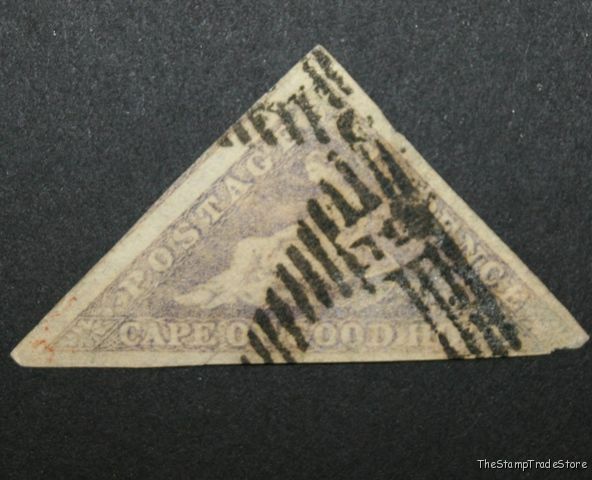 It later transpired that a consignment of stamps from London had arrived on 5 May 1860, that bills of lading went astray and it was a year later that the cases with the stamps were claimed. 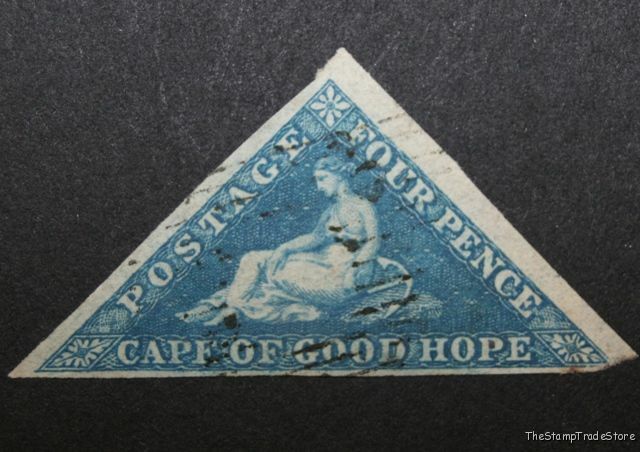 1) There is a bunch of 6 “Grapes” between the lower corner and the “C” of CAPE. 2) Look for the “Rainbow Hill” of the lines between the lower right corner and the last letter value. 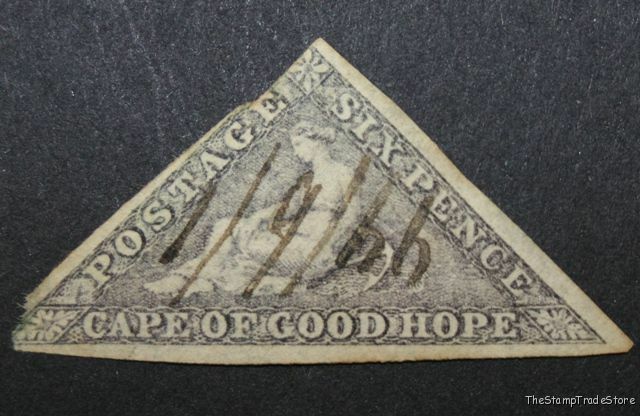 3) Find the ”Boomerangs” in the background engraving, above Hopes right arm, behind Hope and above the anchor. Look for 3 points that form the boomerang. 4) There is a bunch of 7 “Grapes” between the lower right corner and the “E” of HOPE. 6) The 3 corner “Florette’s” al have bulls eyes in them. 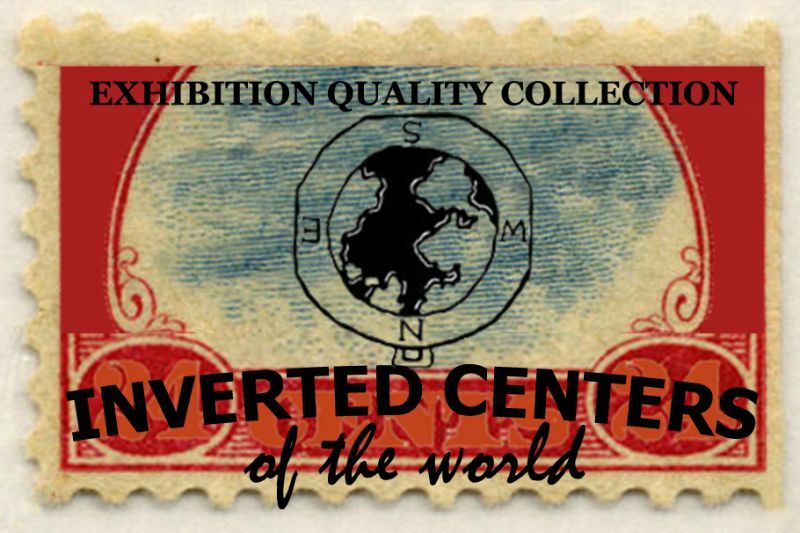 It’s not always easy to spot the watermark, especially if there is still some paper or hinge attached. There are special machines to see the mark, but usually angle the stamp against a matt black background until the light shines at the right angle and you can see it. 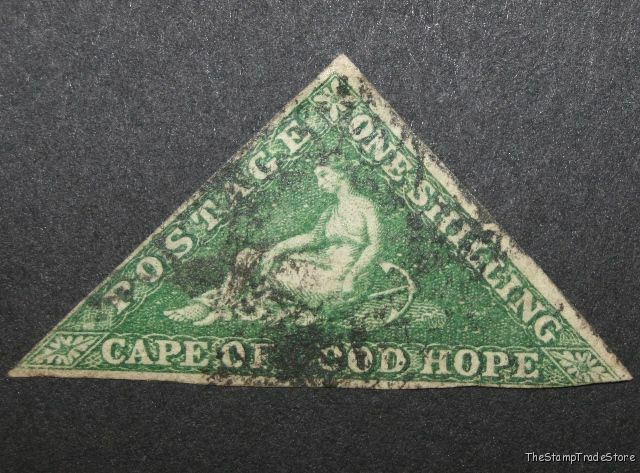 Another way is to soak the stamp (don’t soak the mint one), in clean water and watching carefully you can often see the watermark appears as the stamp soaks itself.